Arkanasas Gary, Alaskan Todd, Boston Tom, NJ Ed, Kentucky Carroll & South Carolina Hal. 29th March The boys do it yet again, 7 gold coins in a week !! All I keep saying at the moment is what an unbelievable day and keep hoping for a quiet one, a few coppers the odd crotal bell or buckle. Then I take lunch out to the guys and South Carolina Hal, who is on his last half day by the way, sticks this into my hand. 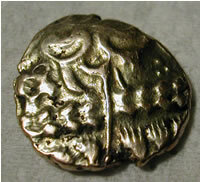 What a find, a Celtic full stater forgery, from the Celtic period. Never seen one before and it must be one of the most interesting finds to be made on my land. Then Alaskan Todd does it again, yep gold. An Australian Victorian Sovereign within the last few hours of going home. 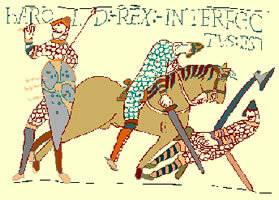 I have posted a few bits with lots more to follow. 28th March 2003 Arkansas Gary goes and does the double gold !! What an unbelievable hunt, ringpulls are rarer than gold this week !!! That's 5 gold coins in a week and Arkansas Gary, NJ Ed are here for another couple of weeks yet !! Todd, who is a good friend of Gary must have rubbed his luck onto him. Sunday also sees the return of the' human dynamo' Boston Budd. Ed has unfortunately been here to witness all the Celtic gold finds but has yet to bag one himself, hopefully his time will come.There have also been some other great finds including a huge Elizabeth 1st silver shilling. I will post a few of the choice bits now. 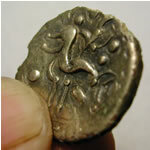 Boston Tom heads back to the good old USA having found the best silver Roman to be found on my land. 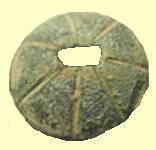 Once it is ID'd by the experts, I will confirm that is the first pre-invasion coin and could be even BC, what a find. Very nice relic, looks like a mug handle. We all have our theories on it's date !! 25th March Alaskan Todd does the double gold !! Alaskan Todd is now be given the name by the guys as 'gold finger Todd' as he bags a mint condition Victorian gold coin, his second gold on the trip!! He is also going 'hell for leather' to take Canadians Brent's weekly coin record if he maintains his average. Not sure what this is but I have one too ! 25th March 2003 Yet another Celtic gold find !!! The day before we all got totally skunked on new land and then this pops up. Unbelievable, this is like the Californian gold rush !! 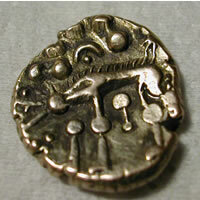 Alaskan Todds second day produced another full Celtic gold stater, this one is in the book as a Norfolk wolf type I think BC in date. I have sent a picture off to the experts to confirm it. 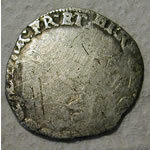 Kentucky Carroll and Hal continued hunting the area where the Stephen came up and again Carroll pulled up an early Richard the 1st (Richard the Lionheart) hammered silver penny in real nice condition, slightly bent but easily straightened. Load more great finds to post later. 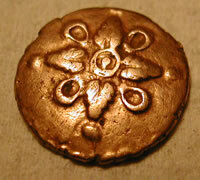 Addedomaros Floral Trinovantes tribe, c.45-20 BC, what a find !! 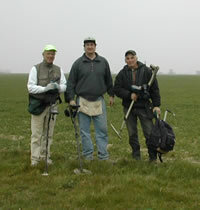 What a day, Boston Tom and Alaskan Todd joined the hunt lunchtime and we hit the fields. Gary managed to turn up another couple of early 17thC hammered tokens and then Tom found the most beautiful early Roman silver I have seen. 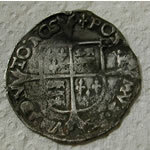 He followed it up with a rare Scottish hammered 14thC Robert the Bruce 1/4 silver. 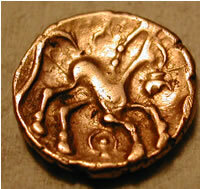 Mark found his first ever Celtic gold a 1/4 stater. Meanwhile Hal & Carroll were trying out another field and found a very rare Stephen 1135 AD silver penny in exceptional condition. Amazing set of rare finds. Arkansas Gary is whipping the guys with his big coil. He picked up that beautiful tiny hammered James 1st half penny and the Royal farthing, it appears size does matter especially when it is 18inches!!! 20th March 2003 Extra post, Great find !! Just been out to deliver the guys lunch and this little beauty was found. 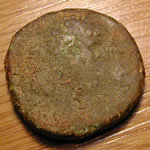 What a great find, a full Philip and Mary Groat, a very rare hammered indeed, just had to post it. Slow start to the new hunt with hammered silver in short supply. 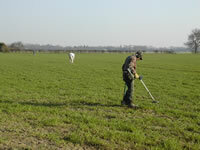 Myself and Gary managed to get well skunked hunting for Celtic gold the other morning!! Still some really interesting bit and pieces showing up. Gary's new monster 18inch coil is pulling up lots of early coppers, including that huge County Token.